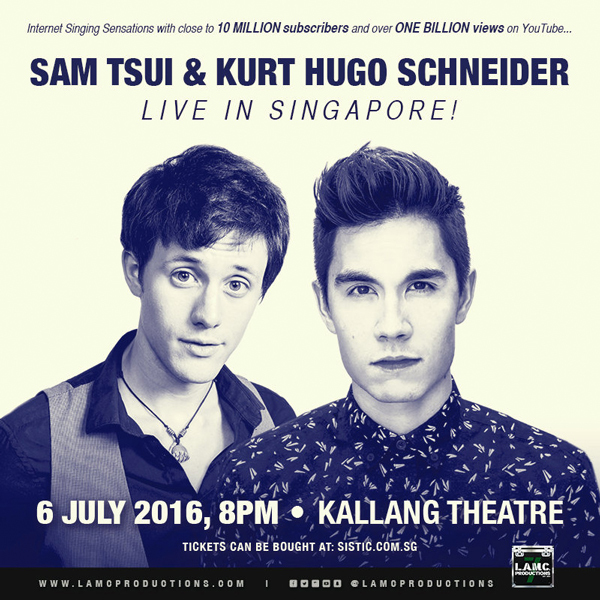 LAMC Productions is proud to announce American YouTube superstars SAM TSUI and KURT HUGO SCHNEIDER will return to Singapore for a one night only concert on Wednesday, July 6, 2016, 8pm at Kallang Theatre! Sam Tsui and Kurt Schneider, hailed as internet singing sensations were among the very first musicians to establish a hugely popular music-focused channel on YouTube. To date, their videos combined, including covers, medleys, and mash-ups, have amassed over ONE BILLION views and close to 10 million subscribers on YouTube alone, contributing to their ever-expanding worldwide fanbase. Tsui and Schneider have been able to harness the ever-changing tools of the digital music age to independently create internationally popular channels and brands, garnering them countless TV and magazine appearances, including The Ellen Show, The Oprah Show, Entertainment Weekly, and In Style Magazine. Both Tsui and Schneider have also applied their powerful digital platform to many brand deals, including KIA, Dell, and a national spot with Coca Cola that ran during the 2014 Super Bowl.